Mangalore, 22 June, 2016:An Anti Dengue Fever Campaign was organized by Ayurvedic practitioners at Mala village in Karkala taluk on Sunday, 19th June. About 300 patients were supplied by Ayurvedic remedies outside Government Primary School, close to the Primary Health Centre, Mala. The patients were provided with free medications sufficient to last 20 days each. Necessary diet was prescribed, importance of fluid consumption and avoiding mosquitoes was advised.Dr Sathyanarayan Bhat, an authority on Lepto Dengue fevers and former Principal of Government Ayurvedic Medical College, Mysore led the campaign and awareness programme. “As Mala village which falls in our vicinity is suffering from an outbreak of Dengue fever, our group of three made a small effort to address the epidemic,” said Dr. Nanda Pai, a reputed Ayurvedic practitioner who participated in the outreach programme. 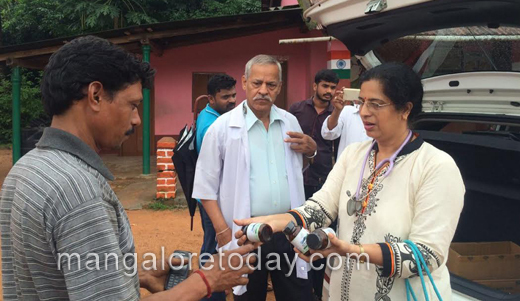 Dr. Nanda Pai, who runs Athreya Ayurveda Kendra and Ashwini Clinic in Karkala said she had received reports that many people were desperately resorting to home remedies without any clinical guidance. “I found that people were recklessly consuming papaya with the belief that it cures dengue. Even with home remedies, one has to be judicious,” she says. Neelakantha A. Karije, a Chartered Accountant from Bangalore and Dr. Paul Salins, a surgeon based at Switzerland who has been working for cancer eradiation jointly contributed medicines worth Rs. One Lakh. Dr. Salins is also the Advisor of Drug Development for Organic India. Ajit Hegde, Mala Panchayat President and Sharath Chandra Ballal, a local community leader, were also present apart from Neelakantha A. Karije, who personally attended the programme. Thanks for the unexpected propagation of the news. By next season of dengue, we can contribute a detailed article about dengue fever, I hope.